Borst68: Time to let this one go. The area has changed a lot since the cache was first placed. I thing the area needs to be given back to nature and regenerate. Thanks to everyone who visited and wrote a nice log. This was our first geocache. A new one has been placed near by. Look for that one soon. This cache is in the Town of Lockport at the Lockport Nature Trails/John B. Austin Park. Parking is on Slayton Settlement Road. In total, there are 8 caches in the park. You are looking for a 3.8 L cammo'ed Lock-N-Lock. It is hidden close to a the trail. This is our family's first cache. We picked this location because this a cool park and is very close to home. Our cache is one of eight caches in this park. My hope is that a new cache will bring more people to this park to search for my cache as well as the seven existing caches. Besides the caches, there are several humongous oak trees and a waterfall in the park. Rocks are also abundant in the park and home to many of the parks garter snakes. It is rare that you don't see a snake in this park. They are friendly so don't be afraid. If you even remotely enjoy nature, this hidden gem of a park is one you will love. Dogs are welcome but will need to be on a leash. Ample parking, as well as the trail head into the park can be found at N43 12.288 W078 39.515 Park hours are sunrise to sunset. NO NIGHT CACHING! 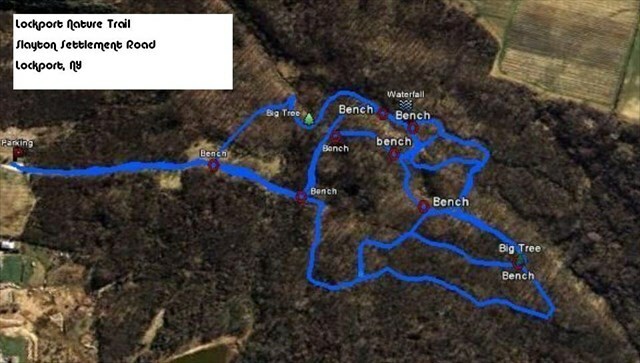 I made a trail map. It is available below. Feel free to use it for this and any other caches you plan on seeking in the park.. As always, please stay on the trails as much as possible. The cache is about 50 feet from the trail. Much of the terrain is difficult off the trail. The quicker way is not straight line in this park. There is a special gift, hand crafted by yours truly, for the FTF. I am also dropping off a travel bug for any finder to move along. The official plant (or semi-official at least) of Niagara County is Poison Ivy. It is abundant in this park. I did not see any poison ivy where I placed the cache but there is some near by. Please take caution and teach any little ones what poison ivy looks like and why you don't want to touch it. There are also some thorns in the vicinity of the cache. The park has abundant trash and recycling containers for your convenience. Have fun and enjoy the park! Ab arrq gb pebff gur perrx. John B. Austin Nature Park Trail MapMap of the park. Terrain is difficult off the trail with many swampy areas and rocks. The quickest route to most of the caches in the park is via the extensive networks of trails.